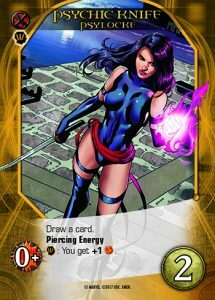 Legendary®: A Marvel Deck Building Game started with two currencies, Recruit and Attack. These points were generated, banked, and then spent to either recruit bigger or better Heroes, or to defeat Villains and Masterminds. 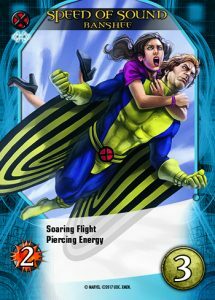 Legendary®: X-Men introduces a new type of currency that allows players to attack in a different way. 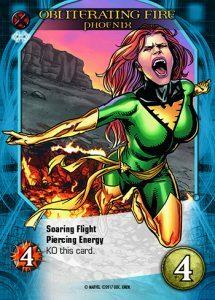 Piercing Energy keyword represents X-Men that use psychic knives or sonic screams to pierce enemy defenses. Using a new icon, players can fight a Villain or Mastermind by spending Piercing Energy equal to that enemy’s printed Victory Point value. Players ignore that enemy’s Attack value and any Attack modifiers. Players can also ignore any special conditions for fighting that enemy. Piercing Energy points cannot be combined with Attack points. 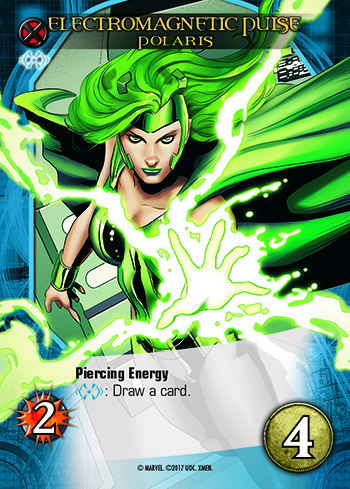 Players also cannot use Piercing Energy against cards that have no printed Victory Point value, like Shadow-X Villains, or Master Strikes that become Villains. 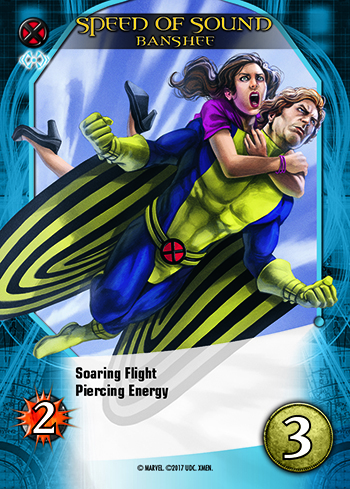 The X-Men are also known to fly into action with rapid reinforcements. The new keyword Soaring Flight means, when a player recruits that Hero, they set it aside. At the end of their turn, they add it to their new hand as an extra card. Cards with Soaring Flight do not enter a player’s discard pile therefore they will not trigger X-Gene effects. 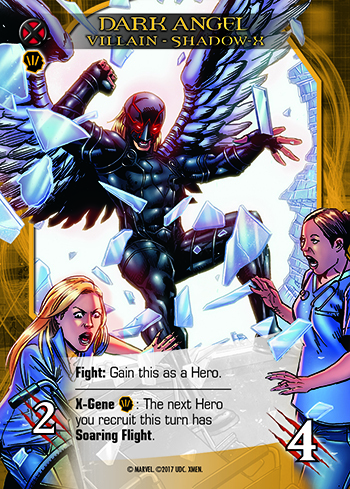 We hope you’ve enjoyed today’s preview of Legendary®: X-Men. Tune in next week when things take a turn towards Evil. 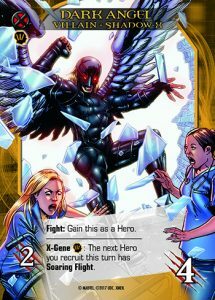 Legendary®: X-Men releases June 28th. Contact your local gaming store to preorder your copy today. 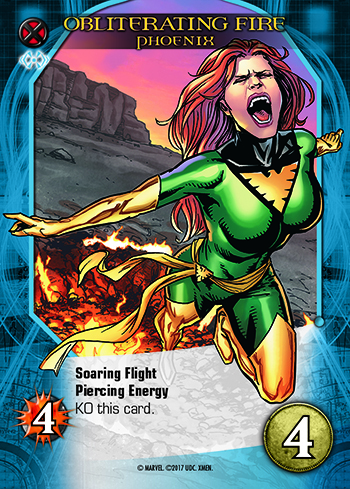 In case you missed any of our other card previews for Legendary: X-Men click the link below. Wow! Piercing Energy looks very powerful. Will be interesting to see how it’s balanced. Excited for next weeks preview. Let’s see what all this “epic” Mastermind stuff is all about. I’m a bit lost on some of the effects of the new keywords and some cards. 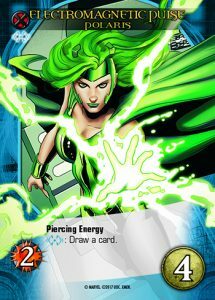 Piercing Energy: Can you add multiple cards with piercing energy to make a stronger piercing attack? Soaring Flight: If the card doesn’t enter your discord pile, where does it go after use? X-Gene: (i.e. Psylocke: Butterfly Effect) Does this card only get 1+ Piercing Energy, though there are multiple covert cards in my discard pile? Piercing Energy – Yes. It’s just like Attack but it can’t be mixed with Attack. 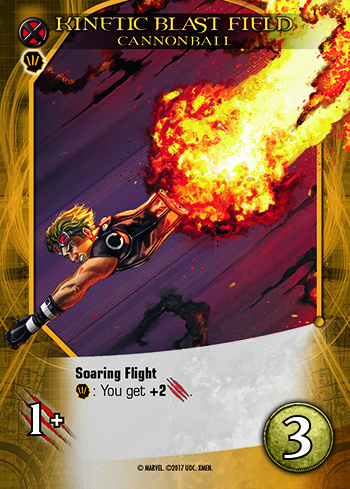 Soaring Flight – This effect only applies when you recruit the card. When you recruit it, it is set off to the side and then added to your next hand. Once played it is then placed in your discard pile just like every other card.